“They prefer soccer by far,” said Phillip Ley, O.F.M. Conv., director of Posada Guadalupe, a house in San Antonio for asylum-seeking young men who have aged out of detention shelters. These young men, who entered the United States as unaccompanied minors, are registered with Immigration and Customs Enforcement. Posada Guadalupe can host as many as 20 young men at a time. They work on their G.E.D.s and learn English while they wait for their asylum applications to be processed. That can take as long as three years. Usually, the young men obtain work permits well before they hear back about their asylum cases. “We usually get them on their 18th birthday. I write a letter to ICE that we will accept so-and-so. So far, the letters I’ve written have worked,” said Father Ley, who has been running the center for the last 12 years. Posada Guadalupe also sets up the young immigrants up with pro bono lawyers at Raices, a refugee aid project in Texas. According to Victoria Neilson, an attorney with the Catholic Immigration Network Inc., undocumented young people are designated as unaccompanied children when they are in the United States without a parent or grandparent. Their petitions are among more than 764,000 immigration cases pending in court, according to the nonpartisan Transactional Records Access Clearinghouse. “The processing time can vary considerably based on where the case is being heard,” Ms. Neilson said in a phone interview with America. Which judge is scheduled to hear the case also affects the processing time, she said, adding that approval rates also vary significantly from one judge or region to the next. Father Ley’s time serving in San Antonio has been a change of pace. He spent many years in missions in Mexico, El Salvador and Honduras. Twenty years ago, a good friend of his was gunned down. Two weeks later, Father Ley was kidnapped. The situation has only gotten worse since then, he said. The young men who arrive at Posada Guadalupe have told Father Ley they come for safety. It may take years for their cases to be resolved, but even in detention, they receive three meals, snacks and a safe place to live. 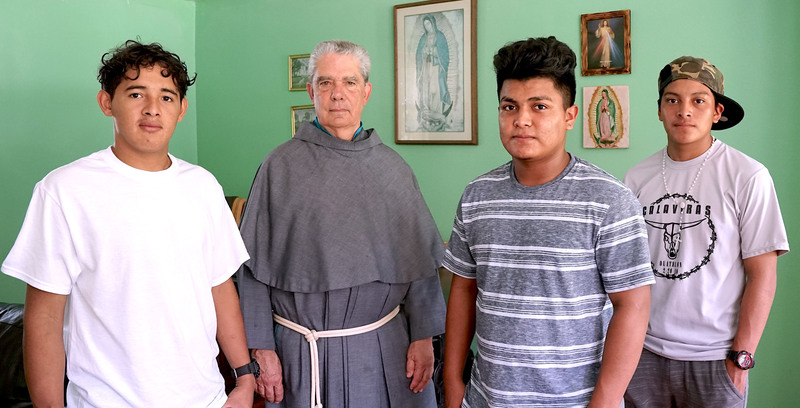 The young men who arrive at Posada Guadalupe have told Father Ley they come for safety. It may take years for their cases to be resolved, but even in detention, they receive three meals, snacks and a safe place to live. Immigration courts have been flooded for years, but even more so since the Trump administration announced its zero-tolerance border policy, Father Ley said. Attorney General Jeff Sessions announced the new policy in May, vowing to prosecute anyone who enters the United States illegally. On Sept. 24, three residents of the Posada Guadalupe huddled together on a couch to watch “Avengers: Infinity War,” dubbed in Spanish. Fernando Andino, who played the movie on his laptop, had seen it before. “Ohhhh,” the other two wowed as the Hulk made his first appearance on the screen, ready for his showdown with Thanos, the chief villain in the series. Mr. Andino, who came from Honduras, had been at Posada Guadalupe for three months. He had been detained by ICE for nine months before his 18th birthday. “They treated us well—they just don’t let you go out,” he said of the detention shelter. “I left [Honduras] because I was having troubles with Mara,” Mr. Andino added, referring to Mara Salvatrucha, a powerful Central American gang that was founded in Los Angeles. “They would pass by the house when I got older,” Mr. Andino said, but was reluctant to go into details. His mother is involved with the gangs and he still has four brothers who live in Honduras. Next to him, Carlos Pereyra, who is also from Honduras, said poverty drove him to the United States. “The only way for me to support my family was to come here,” he said. Mr. Pereyra, who had not received his work permit, has been anxious to leave Posada Guadalupe to start working as soon as possible. He grew up never knowing his father. In the United States, Ms. Neilson said, most think of gang violence as something that can be avoided. But in Central America’s “Northern Triangle”—El Salvador, Guatemala and Honduras—there are neighborhoods where gangs function as quasi-governments. In Central America’s “Northern Triangle”—El Salvador, Guatemala and Honduras—there are neighborhoods where gangs function as quasi-governments. One young man who stayed at Posada Guadalupe was beaten severely for refusing to join a gang, Father Ley said. The gang let him go, but promised to return for him. That is when he fled to the United States. “Gang initiation for boys is that you have to kill someone. For girls, you have to go to bed with everyone in the gang,” Father Ley said. Those who come to the United States are not gang members, he said. At Posada Guadalupe, some of the young men are still in survival mode. They meet with students studying to be social workers at nearby universities. While Father Ley encourages them to study, some are coming with only three or four years of formal education. The young men are really more interested in working and sending money home. Like typical 18-year-olds, perhaps, they do not always clean up after themselves, Father Ley said. He described an incident where a bag of frozen chicken legs went to waste because the bag was not sealed properly. “You have to keep on them,” he said. It seems to work. The young men recently teamed up to cut the lawn with a weed wacker since the lawnmower was broken.